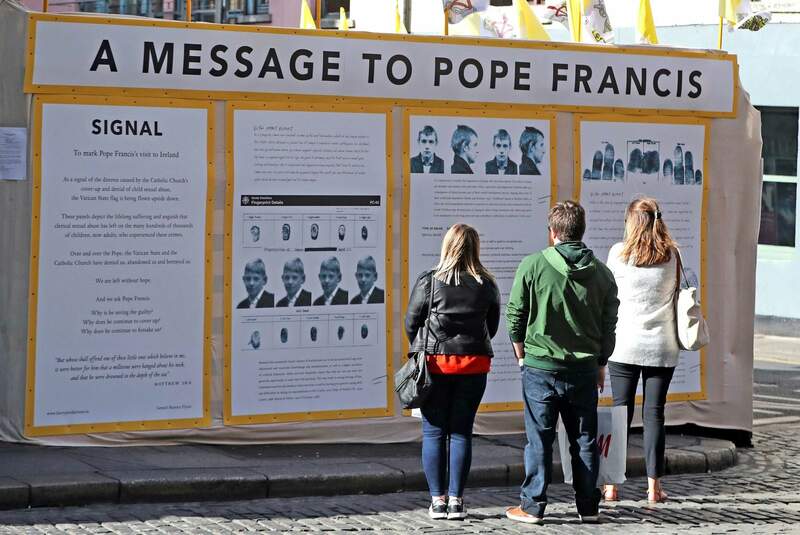 An art installation by Manix Flynn protesting the Pope’s visit is seen in Dublin City center, Ireland, on Thursday. When St. John Paul II visited Ireland in 1979, the Catholic Church wielded such power that homosexuality, divorce, abortion and contraception were barely spoken of, much less condoned. Catholic bishops had advised the authors of Ireland’s constitution, and still held sway. Today, as Pope Francis prepares to visit, the Catholic Church enjoys no such influence. DUBLIN – A prominent Irish survivor of priestly sexual abuse told a Vatican-sponsored conference Friday that the Holy See must put in place “robust structures” and strong sanctions to hold accountable bishops and Vatican officials who fail protect children from predator priests. Marie Collins, a former member of Pope Francis’ abuse advisory board, urged Catholic families attending the Dublin conference to ask why the pope scrapped such a structure – a proposed Vatican accountability tribunal – several years ago. Collins was the headline speaker at a panel discussion on keeping children safe from pedophiles at the World Meeting of Families, a once-every-three-year Vatican-sponsored rally meant to encourage and energize Catholic families. Francis arrives Saturday in Dublin to close out the conference with a Mass on Sunday in Dublin’s Phoenix Park. Cardinal Sean O’Malley, Francis’ top abuse adviser, had been expected to head the Dublin safeguarding discussion Friday but stayed home due to what he called “serious pastoral needs” in Boston. O’Malley launched an investigation into his diocesan seminary, and removed its rector, after reports of misconduct went public. It’s the third seminary – including Philadelphia and Seton Hall, New Jersey – that are now under church investigation because of reports of sexual misconduct and possible abuse. 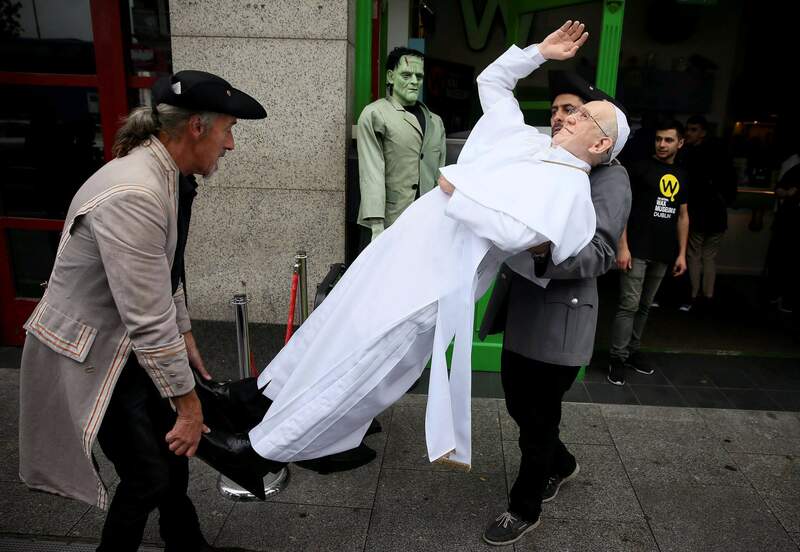 A newly unveiled wax work of Pope Francis is carried at the National Wax Museum Plus where they also unveiled a newly refurbished original 1979 Pope Mobile ahead of Pope Francis’ visit to Ireland, in Dublin on Thursday. “The actions of the church do not match the words, and they are in fact totally the opposite,” Collins said to applause.